I’ve always been an animal lover, but it was Petey who inpired the creation of Dog Rescue Success, and our July 23rd Bloggers Unite for Dog Rescue campaign. I’ve always had rescue companions in my life. When we adopted Petey, his history really tugged at my heart. He was a sweet, good-tempered guy who had been turned into a bait dog at the hands of his “owner”. His life was spared from the goodness of the hearts of the female officer who originally rescued him, and Forte Animal Rescue.. Had it not been for him, he would have died long ago. Because of Petey, and the many wonderful rescue organizations I have encountered in my lifetime, I wanted to give something back to them. I wanted to acknowledge and promote the good the organizations and the people behind them do. For those companions in search of a forever home, I want to give them a voice. 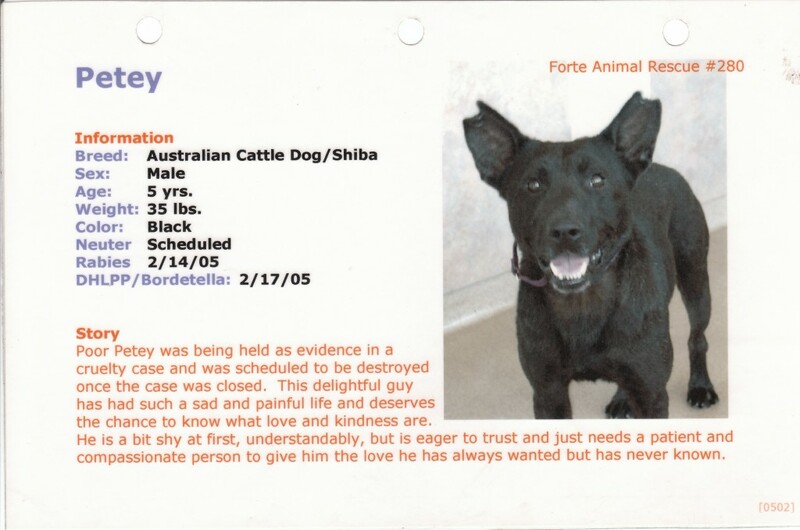 For all of the “Petey’s” in the world who made it to a forever home and give us their unconditional love, I wanted to give that love back by sharing their stories. We will be featuring rescue groups, trainers, and rescue-friendly organizations on a regular basis. I would love for you to help us on July 23, 2012 by posting any rescue related story and helping us raise awareness to the importance of Dog Rescue. If you have a blog – please help us promote by using one of the badges to the right of this page. If you’re on ANY kind of social media, please help us promote the event, and posting a rescue related story and posting the link on this page in the comments section. Thank you SO much for helping us give a voice to the dog rescue community! !